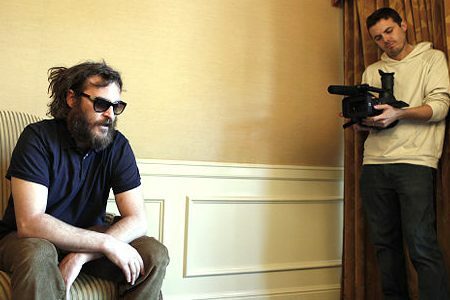 The trailer for I’m Still Here, the documentary chronicling Joaquin Phoenix’s bizarre year of pursuing a rap career while alienating Hollywood, has finally been released. While we anticipate finally getting a look in I’m Still Here at what his surprising physical appearance and new career path is all about, we thought a look back at Phoenix’s road to infamy was in order. Being unconventional is nothing new for Joaquin Phoenix, especially if you take into consideration that he spent his formative years on the road handing out religious pamphlets and playing music throughout Central and South America with his missionary parents. His family eventually landed in Los Angeles and he went by the name of Leaf during his early acting career. After turning in an impressive performance as the troubled son in the movie Parenthood he left Hollywood for a few years. After his brother River Phoenix’s fatal overdose, which he witnessed, Joaquin got back to work, usually taking on dark, brooding and complex roles. From the murderous teen in To Die For to the conflicted priest in Quills to the viciously jealous Roman emperor in Gladiator, Joaquin Phoenix has never been accused of being light and breezy. 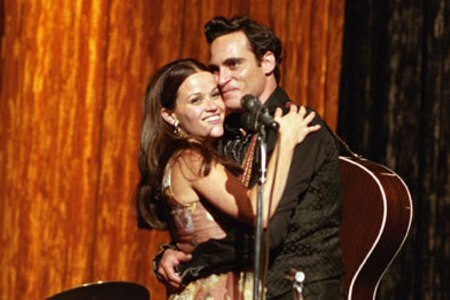 Perhaps his most lauded role was that of the legendary Johnny Cash in Walk the Line, also starring Reese Witherspoon. Upon taking the part, he underwent intense vocal training and even won a Grammy for the soundtrack. Naturally, tackling rap was the next step, right? It was more roundabout than that as after spending time in rehab for alcoholism, Joaquin Phoenix again took a break from acting and directed a few music videos for, among others, She Wants Revenge, Silversun Pickups and Albert Hammond Jr.
During all this, Joaquin Phoenix remained a committed animal and human rights activist, working on behalf of PETA, Amnesty International, The Peace Alliance and The Lunchbox Fund. He was also honored with a Humanitarian Award for his voiceover work on Earthlings, a documentary about animal abuse. Joaquin Phoenix starred in three more emotionally intense films, We Own the Night with Eva Mendes and Mark Wahlberg, Reservation Road with Mark Ruffalo and Two Lovers alongside Gwyneth Paltrow, before retiring from acting. While promoting Two Lovers, Joaquin Phoenix infamously appeared on Late Show with David Letterman sporting an unruly hairdo and bushy beard. He spoke incoherently and was unresponsive to David Letterman’s inquiries, unless he was trying to convey how serious he was about his newfound rap aspirations. Aside from the obvious absurdity of the albeit unconventional thespian taking on rap music, the fact that his brother-in-law and friend Casey Affleck was documenting his transition made the public and critics question the validity of it. So, now that I’m Still Here is on its way to the masses, will we understand Joaquin Phoenix’s foray into rap any better? Is rap just an extension of his offbeat creativity? Is he a product of his unusual childhood? Is he trying to work out his demons? Or is Joaquin Phoenix finally showing us his sense of humor Andy Kaufman-style? We may or may not find out when I’m Still Here premieres in theaters. Is Joaquin Phoenix’s breakdown a fake?